Hey The 36th Avenue readers! It’s Tausha with Sassy Style Redesign and I am so excited to be here. I love Fall! I love the idea of wearing jackets and sweatshirts, cooking soup for dinner and cool, crisp nights! Plus, I ♥ decorating for Autumn and Halloween! I dare say that I love it almost as much as I love decorating for Christmas! 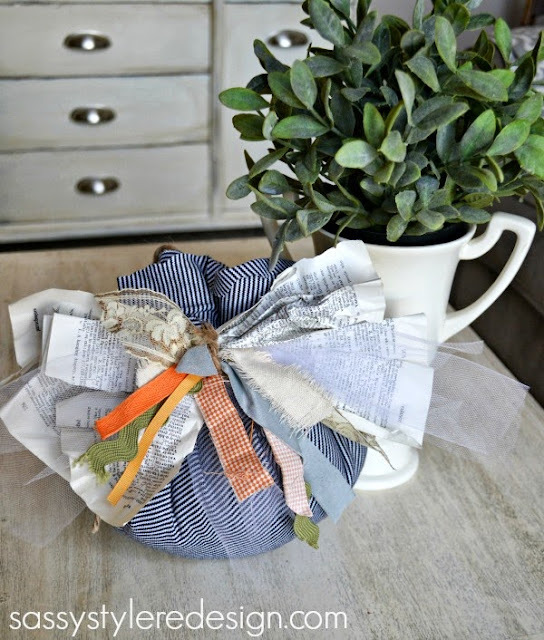 Today I am sharing a simple idea to bring some fall touches into your home. …. 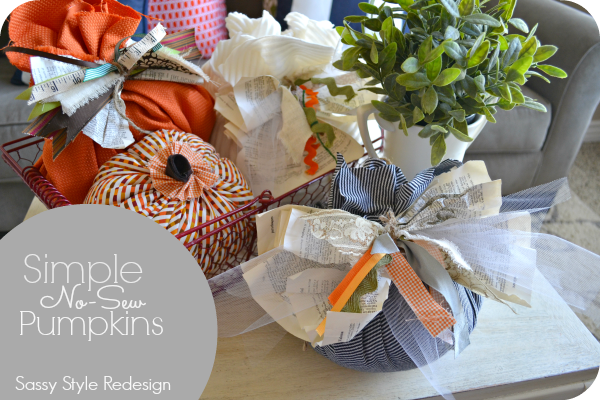 No Sew Pumpkins …. I can’t sew to save my life. I glue. I have been known to make pillows using my glue gun. 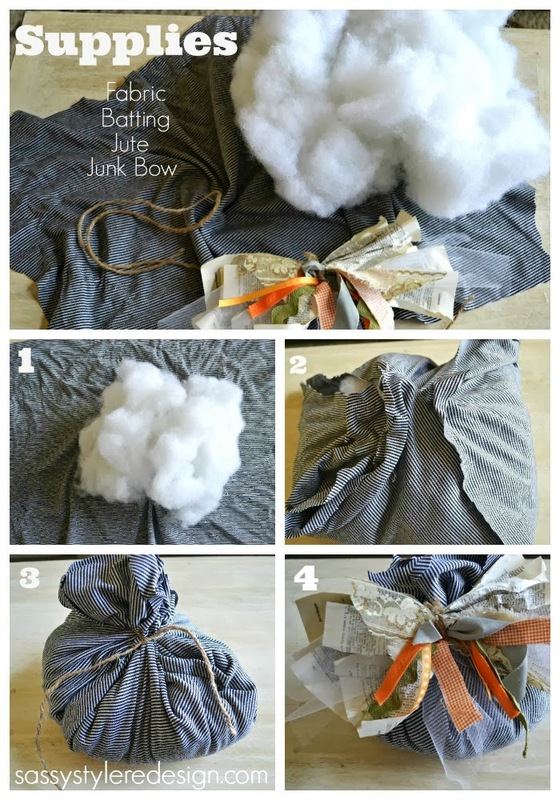 So if you are a sewer, or a non-sewer, this project is perfect for you! A square piece of fabric. You will want to use something that has a little bit of stretch. Once you have all of your supplies gathered, you are ready to create your pumpkin. Warning, this whole process will take you less than 5 minutes. 3-Tie your pumpkin shut with jute, twine, ribbon etc..
5-Admire your 5 minute pumpkin! But wait,. are you wondering what the heck a junk bow is? Oooh-this is one of my most favorite things to decorate with for holidays! I put them on pumpkins, skeletons, wreaths, and anything else that I can think of. I love these pumpkins! I use them all over my home during the fall season. 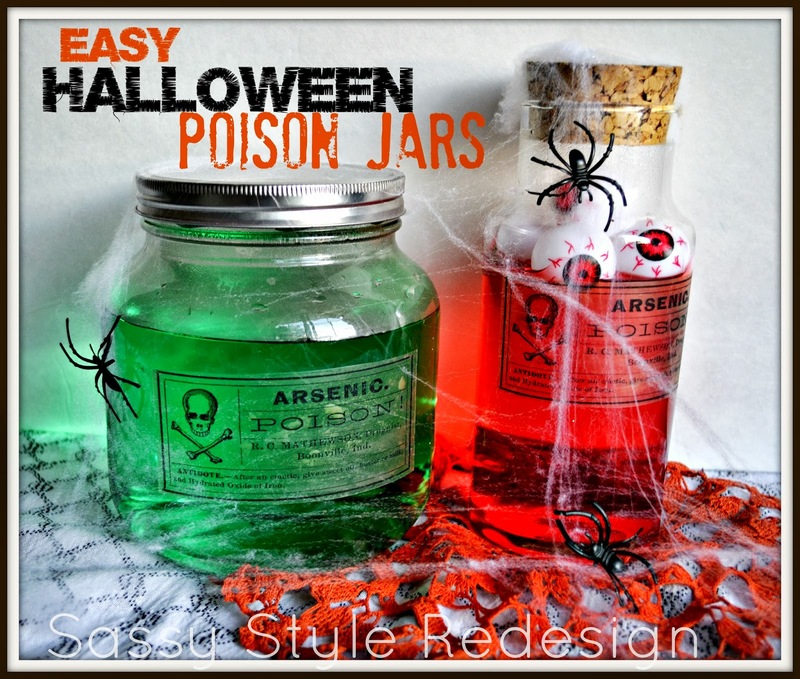 I love that they are versatile and can be used a autumn themed decor & or Halloween decor. I hope that I have inspired you to try making your own no-sew pumpkin. 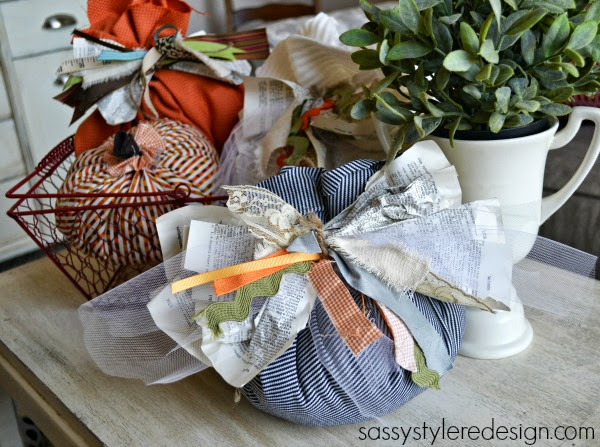 It will be one the easiest decorations that you will make this season! 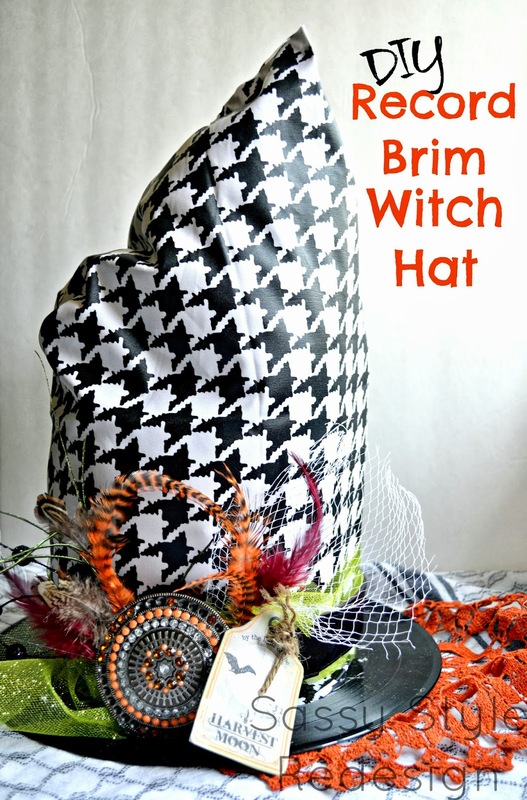 If you love decorating for fall and Halloween as much as I do, then you might love these past Halloween decor posts. I would love for you to stay in touch! Oh my! I am in love with that bow… so cute! 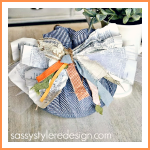 Thank you so much Tausha for visiting with us today and sharing with this adorable Pumpkin Tutorial. 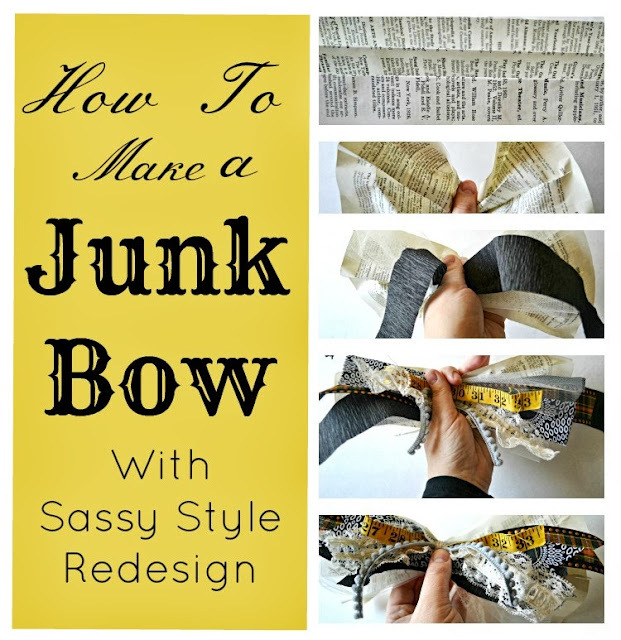 If you follow Tausha you know already how fantastic her blog Sassy Style Redesign is. If you don’t follow her this is the perfect time to do it. You are going to lover her as much as I do! 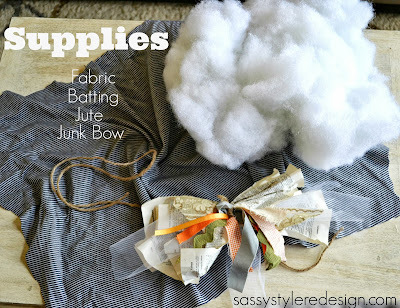 Love anything no sew too! I can do it…but I prefer not to! This is a fun idea Tausha! I love anything No SEW!! Cute, Tausha!